This is one of those delightful dishes that is much, much more than the sum of its parts. At first glance, it’s nothing more than grated carrot with a light dressing. The flavour is subtle and slightly sweet though, with a hint of lemony tang. It’s great as a side dish and also wonderful to add a bit of crunch to sandwiches. In our photo, it’s served toasted on toasted muffins with hummus and sliced avocado, inspired by the absolutely fantastic Jacqueline at Tinned Tomatoes. Note that les francais put parsley in their recipes but we don’t like this because it sticks in your teeth so we’ve left it out. You can add a handful if you fancy it though; maybe you won’t suffer the same parsley-teeth affliction. If you fancy changing the texture slightly, as well as boosting your energy, potassium and fibre intake, add a handful of sultanas. 1 Place the grated carrots in a large mixing bowl. 2 Put all the other ingredients in a jar and shake well to make the dressing. 3 Pour over the carrots, mix well and serve. 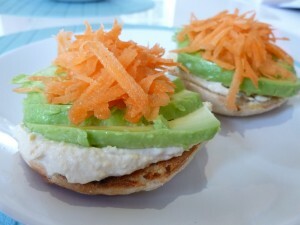 What a great variation on my carrot & hummus sandwiches. They look swish!